HOTEL IN BENIDORM. THE HIGHEST HOTEL IN EUROPE. 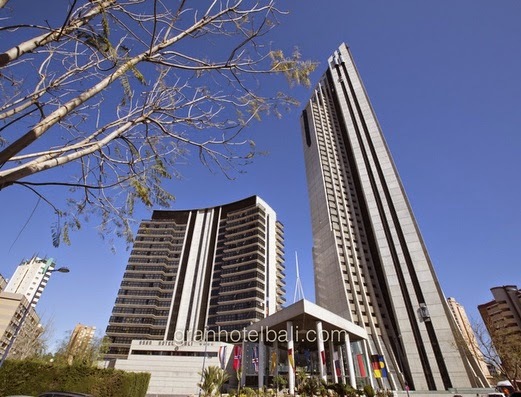 The Gran Hotel Bali is the most emblematic hotel in Benidorm, as it is the highest hotel in Europe and it is located close at hand from the beautiful Poniente beach. Specially designed for sun & beach trips as a couple or as a family, this hotel features complete services, a spa and areas for business travellers and for the celebration of all type of events. The sentence above is an excerpt from the official website of the Gran Hotel Bali. Hotels with name Bali. If you do not know about this hotel, you will definitely think below this hotel is on the island of Bali, Indonesia. Indeed, this hotel is in Europe, in the country of Spain. The hotel is located very close to the beach. The building of this hotel is the highest among the existing buildings nearby. Very high for a hotel. There are a few things I think about the Gran Hotel Bali. Are the guests will feel comfortable while staying at this hotel if you get the room on the highest floor. Do not cringe when you are in the highest room in the hotel building. How to lift if all hotel guests want to get out of simultaneously. If guests want to use the lift at the same time, if perhaps they will feel comfortable when queued waiting for the elevator to arrive. The hotel has a swimming pool on the top floor. What I'm confused, what if the swimming fro many people visit. What about the children.